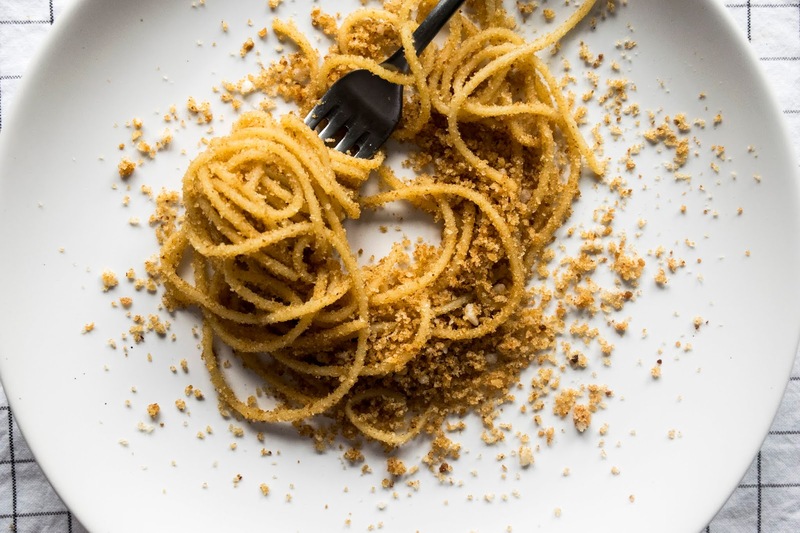 There is a recipe for sweet spaghetti with bread crumbs and walnuts, Spaghetti da Quaresima. I read it is common dish for northern part of Italy, Romagna. You can find the recipe in an Italian cookbook that was first published in 1891, Science in the Kitchen and the Art of Eating Well. My grandma made pasta with walnuts but she would not mix these two, she made dolce pasta either with nuts and sugar or the one from the picture above, pasta with bread crumbs and sugar. When there was nothing ‘sweet' on the table she would made this for us children. I love this dish so much. You don't even need a recipe for it, just heat few tablespoons of oil in a pan and add few spoons of homemade bread crumbs in. Toss for a while to get a bit of color, but not too much (you don't want to burn the bread), add 1-2 tablespoons of sugar, stir and add well cooked pasta. Stir again, place on the plate and eat. Today we cook pasta al dente, but for this dish I usually do as thought by grandma, overcook pasta. I like when mushy pasta sticks to sweet and crunchy breadcrumbs. You can use butter instead of oil, or add spices to the dish, cinnamon, vanilla, cardamom, nutmeg, cloves.. I don't like using any of these, I like it plain, as it is, just sugar and bread crumbs. But dollop of sour cream with a pinch of cinnamon on a side works great. Sometimes I eat this as a main course, but not too many people eat sweet dish as a main. It is a heritage from a childhood that I keep close to heart and with happy belly. Cook pasta a bit longer then recommended. While pasta is cooking, heat the oil in a pan on a medium heat, add bread crumbs and stir for 2-3 minutes, add sugar and stir for another minute or two. Toss the drained pasta in the breadcrumbs/sugar mixture and eat.